I do a great deal of cooking at home and with that comes a great deal of dish washing. I don’t at all mind washing dishes, what I don’t like about it, is the detergents. I’ve tried many, from earth friendly ones to more commercial types. They all wash the dishes just fine, but they all have a really strong scent. We have a dishwasher for the first time and we use it. But it can’t keep up with the pots and pans and large mixing bowls. It is reserved for glasses and plates. That way, it only goes on once every two days. 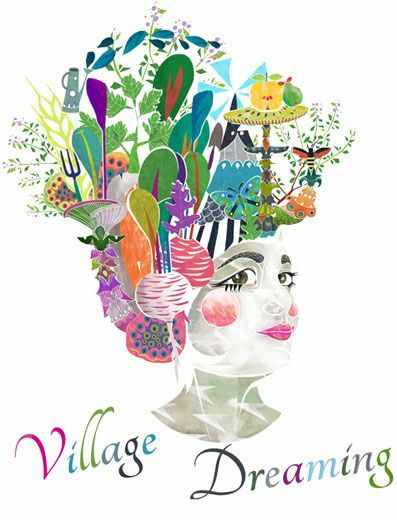 Which is more than enough as it uses vast amounts of electricity and we really take pride in being energy efficient. Breathing in detergent fumes three to four times a day seven days a week is surely not good for me. In fact a few years ago a friend was commissioned to research detergents to learn more about their environmental and health impact and was most unimpressed with the findings, regardless of brand or eco properties. By the end of the investigation, he had stopped using dish detergents in his home. At first, like any first-time endeavour, it can feel a little daunting. The Lye calculator looked a bit intense… and then it didn’t. 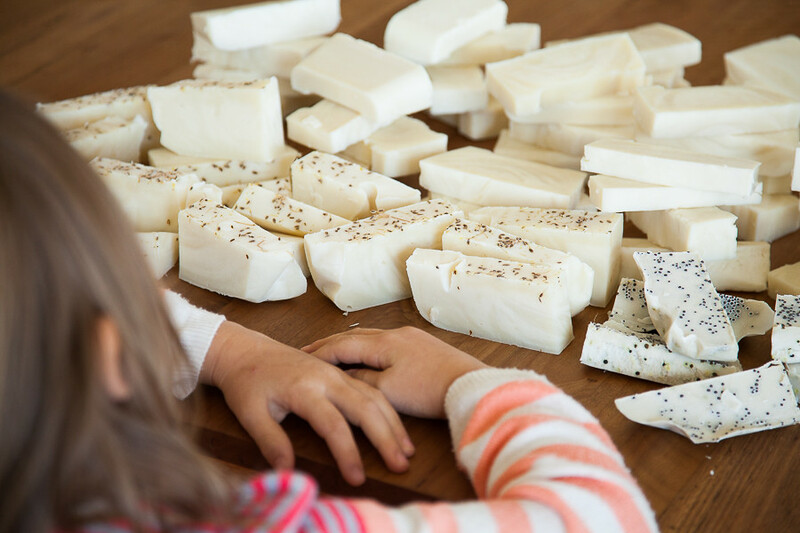 Making soap is really easy. Look for an online Lye Calculator. I have posted the one that I used below. Lye is Caustic Soda and you can buy the caustic soda from a hardware store or supermarket. My understanding so far is that you can’t make soap without caustic soda. But please correct me if you find this not to be the case. You can make your own Lye Water from wood ash to use instead of caustic soda. If you want to make your own lye water look up recipes on the internet. I did not want to go this far. I love making my own this and that but to a point …I don’t want to spend my whole life making everything from its very basic ingredients as I want time for other pleasures too. The below Lye calculator is very easy to use. To find a lye calculator search for Lye Calculators on the internet and you will find a few. The below LYE CALCULATOR asks you what type of Lye you will be using, Section 1, and gives you three choices: NaOH, is Sodium Hydroxide (Caustic Soda). KOH is Potassium Hydroxide (Caustic Potash) and then 90% KHO…I am not too sure what this means but it suggests to me that it is Caustic Potash with a 90% purity. Then it asks you, Section 2, the weight of the oil you are using. 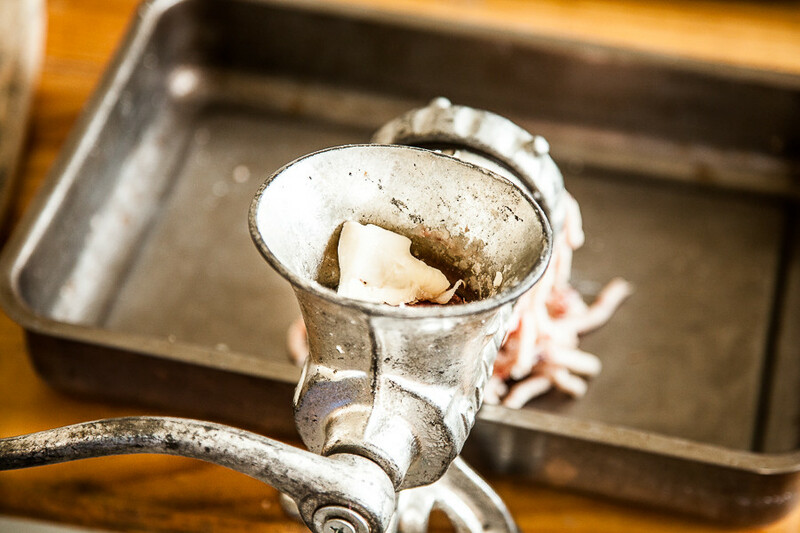 Regardless of whether you are using olive oil, coconut oil, lard or tallow, everything is weighed as an oil because before you can use the tallow or lard you need to render it (melt it) and once it is melted it turns into an oil and it is the oil you then weigh. 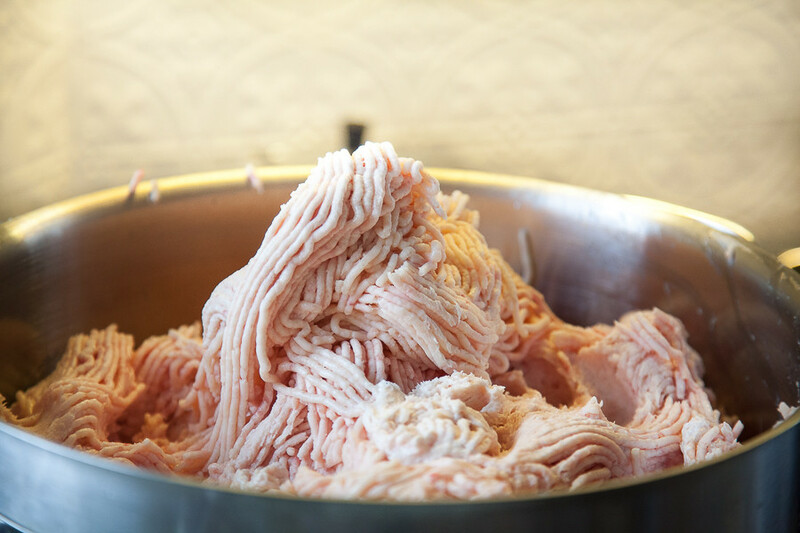 You can’t weigh the solid lard or tallow and take that as the weight because in most if not all cases, the tallow and lard will have bits of meat stuck to the fat. The bits of meat add up to quite a lot and need to be separated out. In today’s example, I will state that I am using 500g of tallow beef oil and fill out the Lye calculator using this measurement. The next step, Section 3, tells you, how much water you will be using as a % and is set as a default of 38 with a Super Fat content of 5%, Section 4, is about Super Fat. This section too is set as a default. As a beginner start with the default settings. 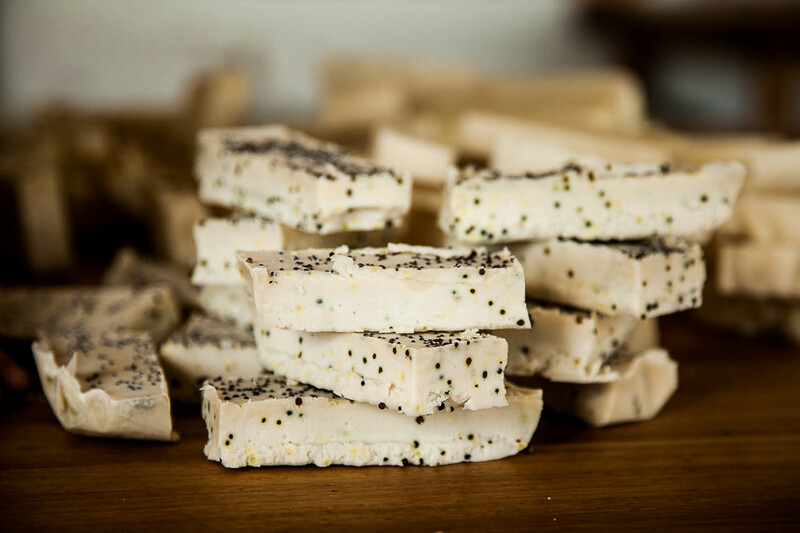 What these default settings do is allow you to make a soap bar that is not too hard and not too soft. Super Fat refers to the amount of fat (oil) that does not combine with the lye during the saponification process. So when you combine the oil with the lye a chemical reaction takes place that creates a new chemical that we call soap. The Lye calculator allows you to work out how to make soap that is either really hard or really soft or somewhere in between. A really hard bar of soap is one where ALL of the oil content has reacted with the lye and bound itself together to make soap. 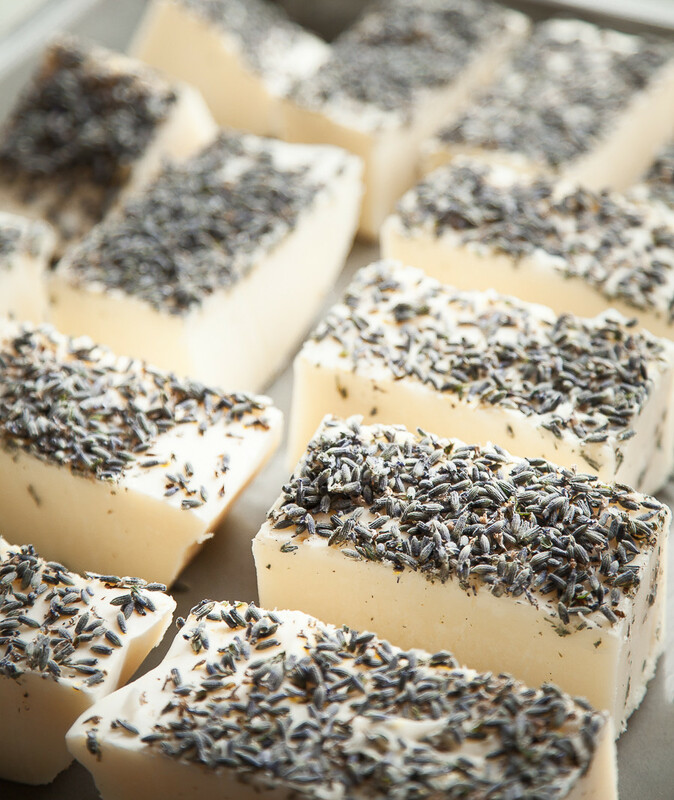 A soap that is soft is one where not all of the lye has combined with the oil because you deliberately added more oil or less lye in order for some of the oil to be free from reacting with the lye and available to moisturise your skin and to create a more creamy soap texture. 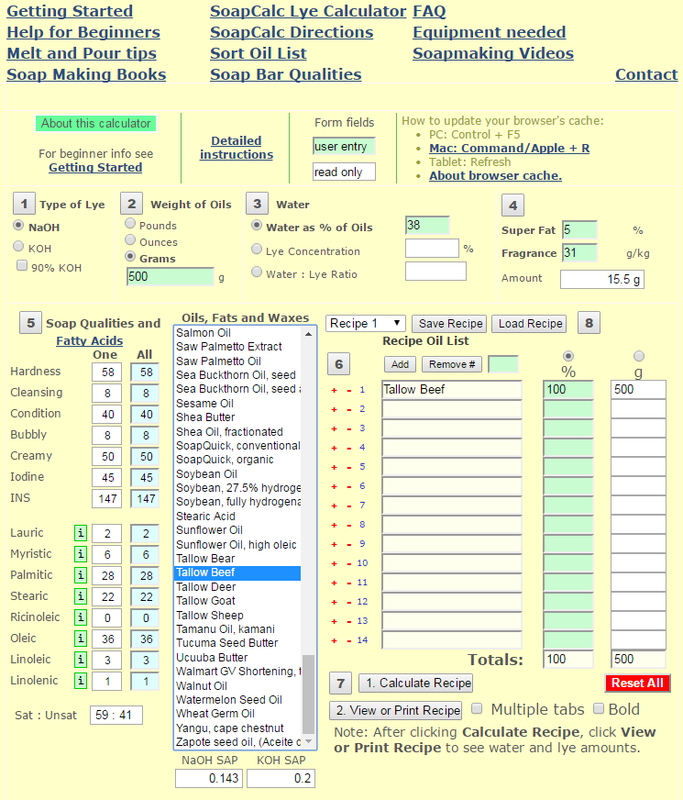 So the soap calculator defaults to a Super Fat content of 5. 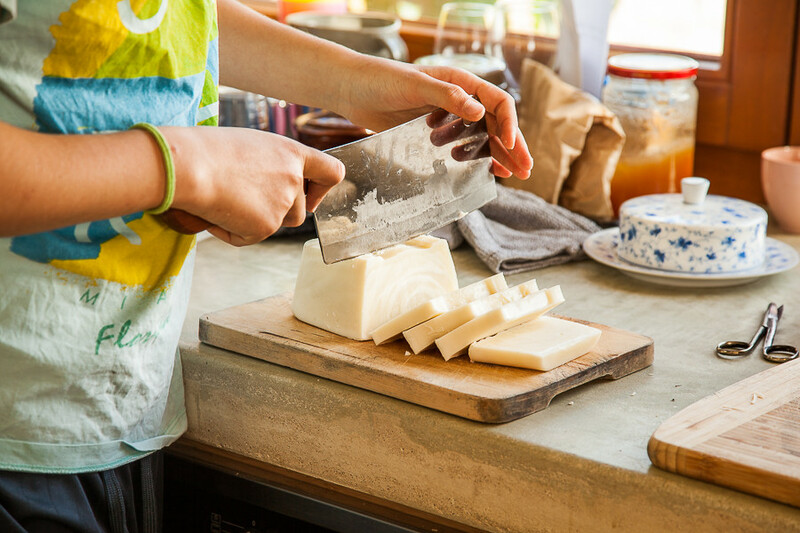 Keep it this way and then as you begin to learn more about the soap you are making you can change the super fat content to above or below five. The lower the Super Fat % the lower the amount of free oil available to moisturise your skin (soften the soap). 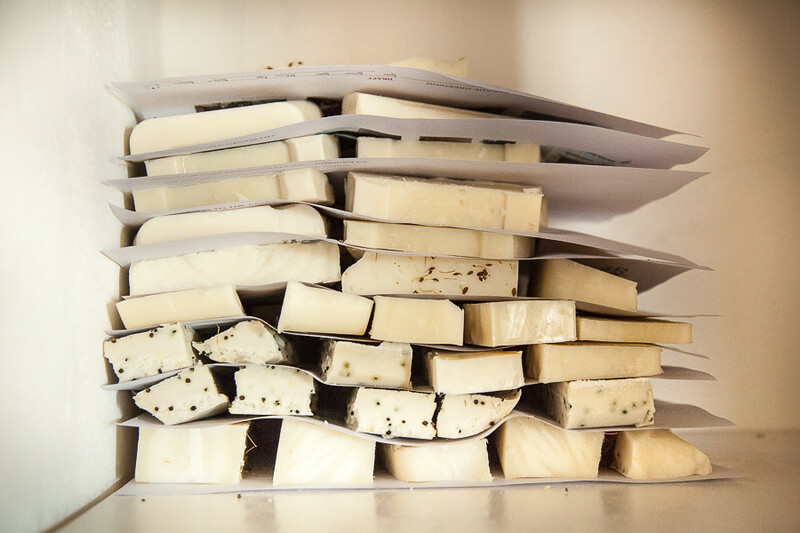 A 0% super fat content means that there is no super fat available on your soap bar, all of the fat (oil) has been turned into soap. The next part of the calculator is Section 5, in this section, you cannot change any of the numbers in the two left-hand columns, instead, under the heading Oils, Fats and Waxes, you choose which type of oil or fat you have. You can see I chose Tallow Beef. 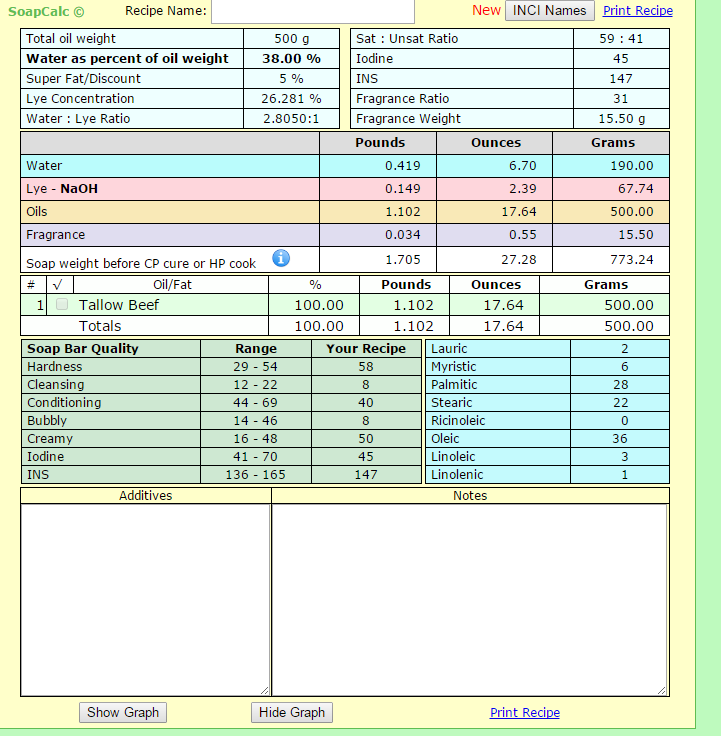 Once you have selected the oil or fat then the numbers in the left-hand column are automatically updated to reflect the properties of your choice of fat/oil. In Section 6, press the Add tab and it will insert the oils (oils) you have selected in Section 5. In Section 7, state the weight or the % of each oil. Easier to state the weight and let the calculator work out the % that weight represents. Then press the Calculate Recipe Tab and it will automatically fill in Section 8, either the Grammes part or the % part of the two columns depending on which column you filled and did not fill. Not all calculators have this level of detail. And some have a far more limited choice of oils and fats to select. I liked the detailed nature of this one. The calculator above looks over the top but once you have used it a few times it will look humble and inviting. Look at the Water, Lye, Oils and Fragrances rows coloured in Blue, Pink, Brown and Purple. This is the information you want to know to go ahead with making your recipe. 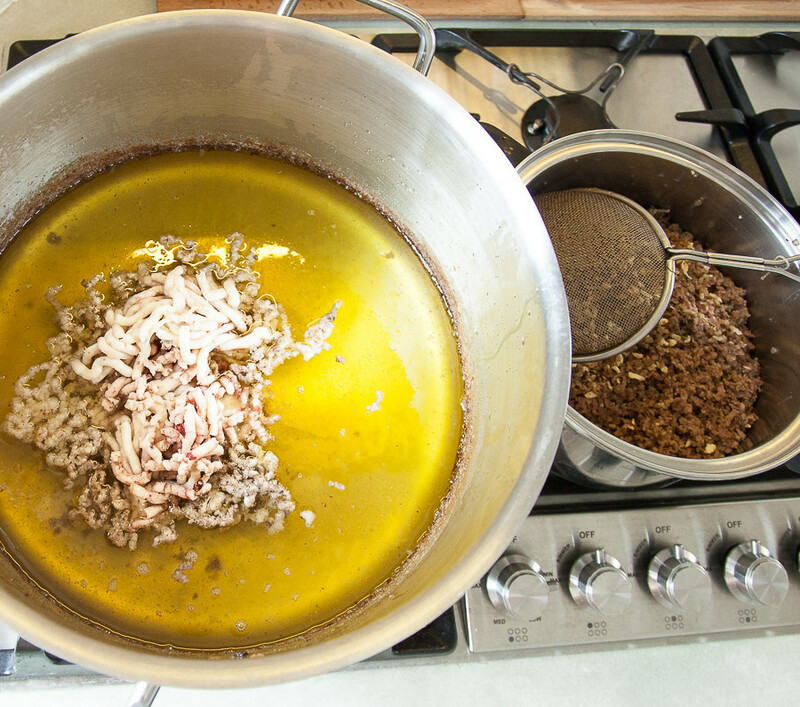 It shows that if I have 500g of beef tallow oil, I need 190g of water and 67.74 g of lye and if I am adding a fragrance such as lavender oil or some other oil, I will need to add 15.50g of the fragrance into the mixture. Now that you have your recipe this is what you will do. 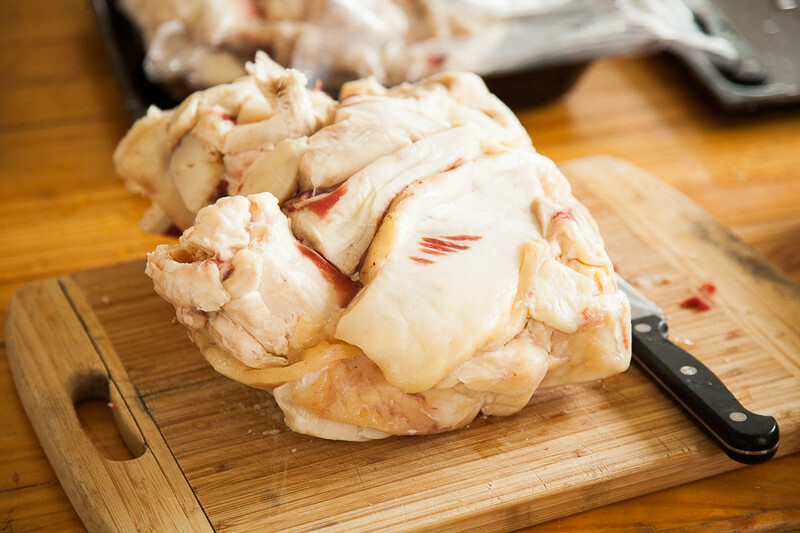 Once you have your fat, which you either received for free from your ethical meat butcher or paid for, you will need to render it. 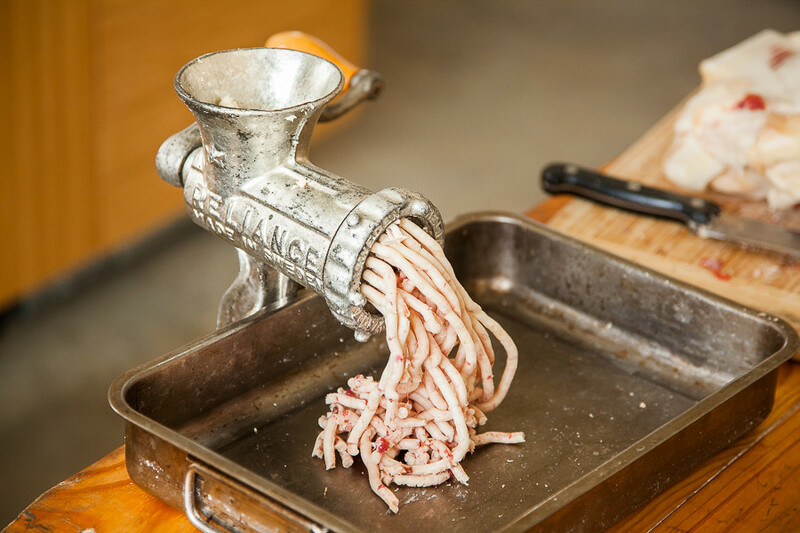 To render it you are best placed to first put it through a food mill (or a strong food processor perhaps?) careful not to burn your motor. You want to break it up into small pieces otherwise it takes a really, really, really long time to render. Food mill. This job takes a while as the fat is really chunky and hard to push through quickly. But I found it worth the while to break it down rather than to stand over a hot stove for absolutely ages. With the fat like this, as spaghetti, it renders very quickly. See all the red in the white fat. That is meat and that meat needs to come out during the rendering process. Fat for rendering. While I used 500g as an example in the above recipe, I was actually working with about 2-3kg as shown by the volume of fat in this picture. Rendering and sieving out gristle. See how much gristle is coming out. 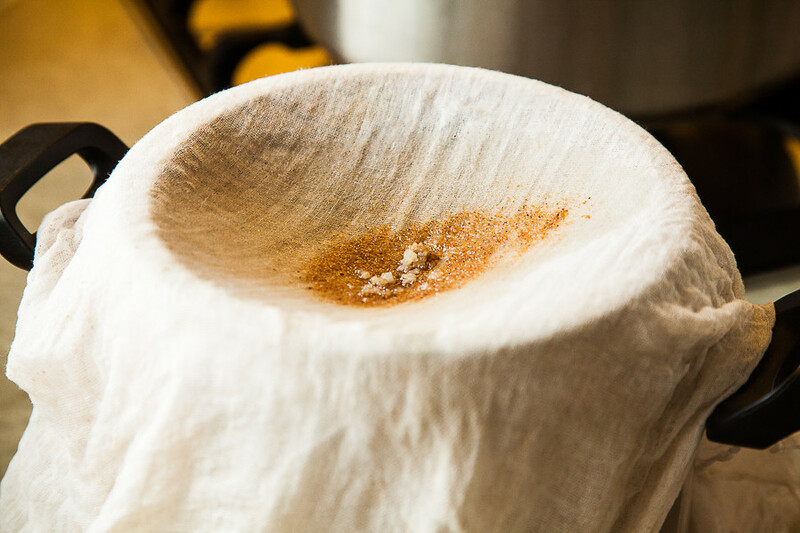 Once all of the large gristle was taken out I then used a fine muslin cloth doubled over to remove the fine impurities at the bottom of the pot. 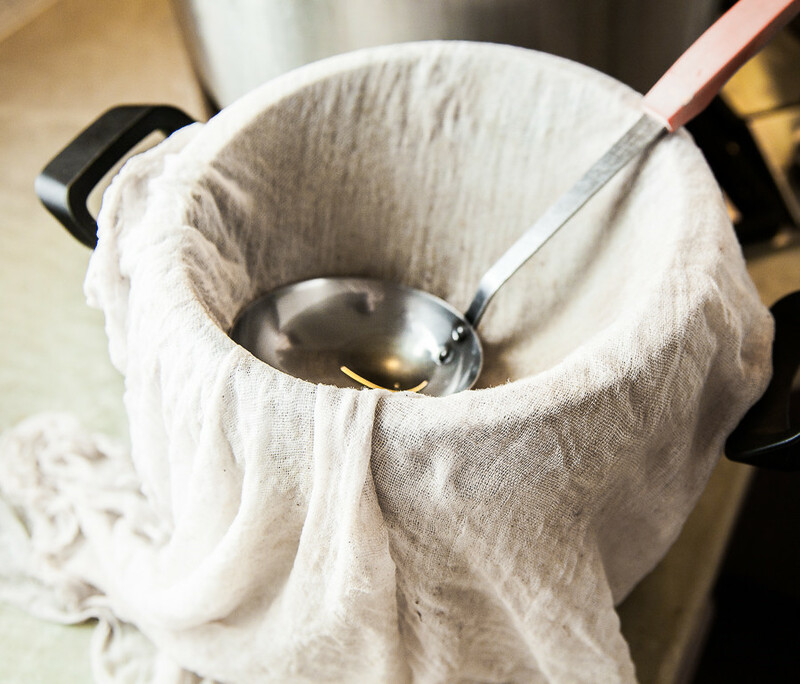 I used a muslin cloth and folded it to create a fine sieve. Last of the impurities and fine gristle. I didn’t take a picture of the caustic soda granules nor of the blue plastic 500g container it comes in. Instead, I’ve jumped ahead. Apologies. The step before this photo would show you measuring out the recipe specified amount of caustic soda, in this case our recipe said 67.74g and then weighing 190g of water as specified by the recipe. You then add the water to a stainless steel saucepan, and you then very slowly add the caustic soda granules to the water. You will wear protective glasses and gloves. The reaction is not explosive at all. It is slow and the water will gradually dissolve the caustic soda and as it does it will heat up. Don’t add all the caustic soda to the water quickly, because if you do this the caustic soda can stick to itself in such a way that makes it hard for the water to penetrate it and dissolve it. Add a little at a time and stir gently. Once it is completely dissolved use a food thermometer to measure the temperature. You want the temperature to be between 48 degrees Celcius and 60 degrees Celcius. 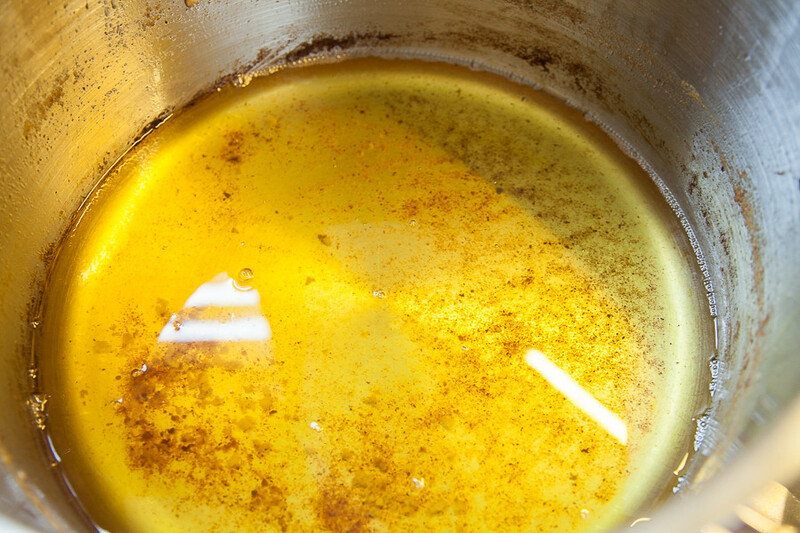 You want the rendered fat (oil) to be at a similar temperature to the Lye Water mixture. 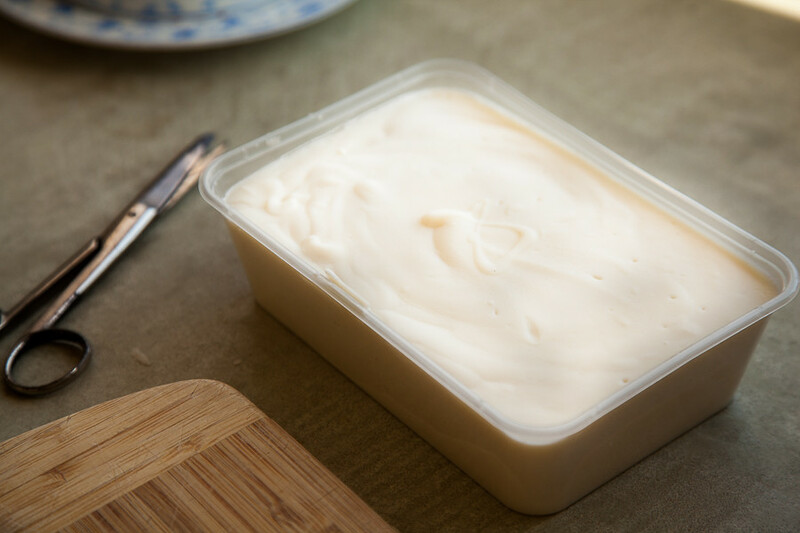 The reason for this temperature guide is that if the oil or Lye Water is too hot, it will saponify too quickly and will give you little time to pour your new soap mixture into the moulds. If too cool it will slow down saponification too much. The above picture shows the combined Lye Water and Oil before it has been mixed. To achieve saponification you need to mix the above mixture with an electric stick blender or a hand held electric mixer. Make sure the equipment you use is stainless steel. Not all hand mixers and stick blenders are. 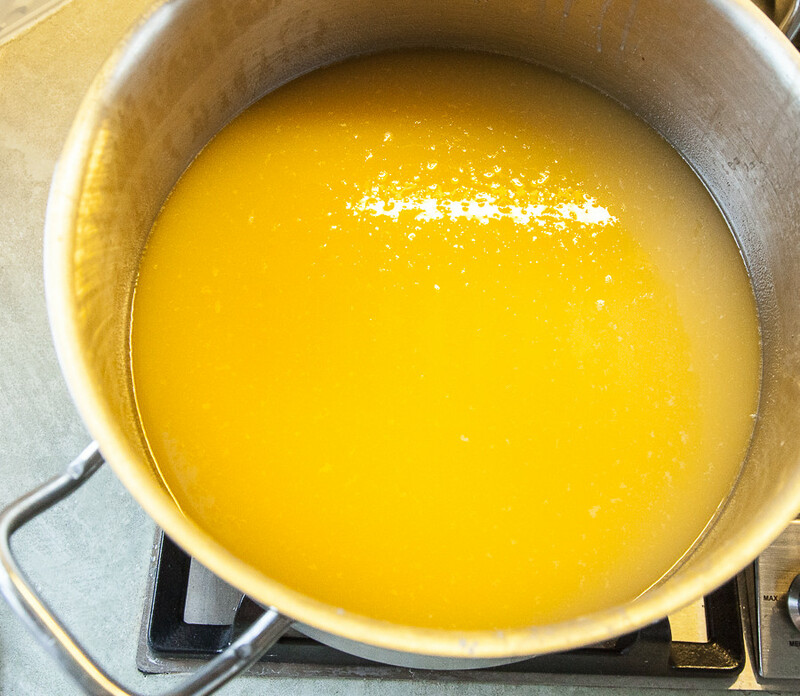 Mix for a long time…to speed saponification up, if too slow, place the stainless steel pot you are working with back on the stove and heat up gently. You will observe saponification as a shiny glistening change to the mix and it will start to thicken (trace is the word used here). You will stop mixing once you have reached Trace. Trace is when the mixture is just thick enough that the ripples caused by the mixing are visible, and hold their shape even once mixing has stopped. Pour the mixture that has reached trace into moulds. Silicon moulds are the best because they are easy to bend when it’s time to remove the soap. I used everything from plastic containers to baking trays lined with greaseproof paper. The plastic container in this picture had to be cut and torn open to remove the soap. Here I used a baking dish lined with greaseproof paper. A glass baking tray with greaseproof paper. Allow it to cure overnight or until easy to handle and then cut. 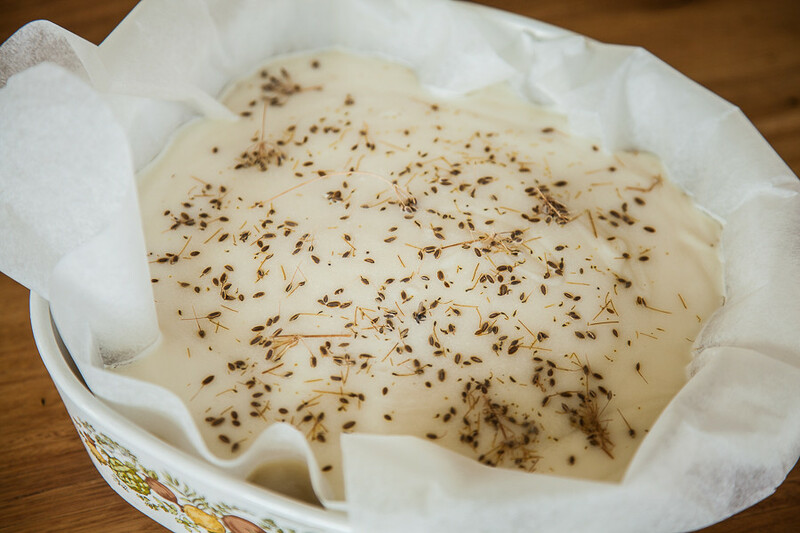 You can add dried herbs (they must be dried or they will go mouldy in the soap) or essential oils to the mixture just before saponification (trace) is reached. Here I used mustard seeds, a bit unusual, normally poppy seeds are used. The green colour is from the mustard seeds. Here I used fennel seeds. I used what I had at the time. 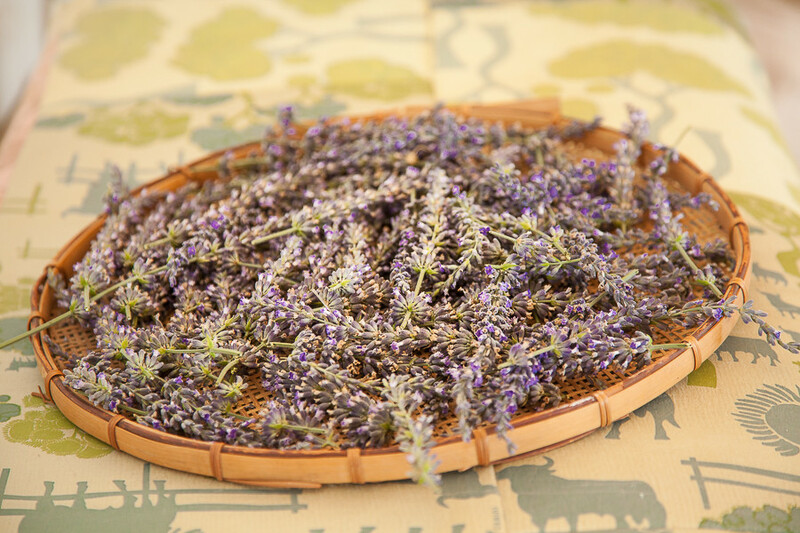 Here I used dried lavender. 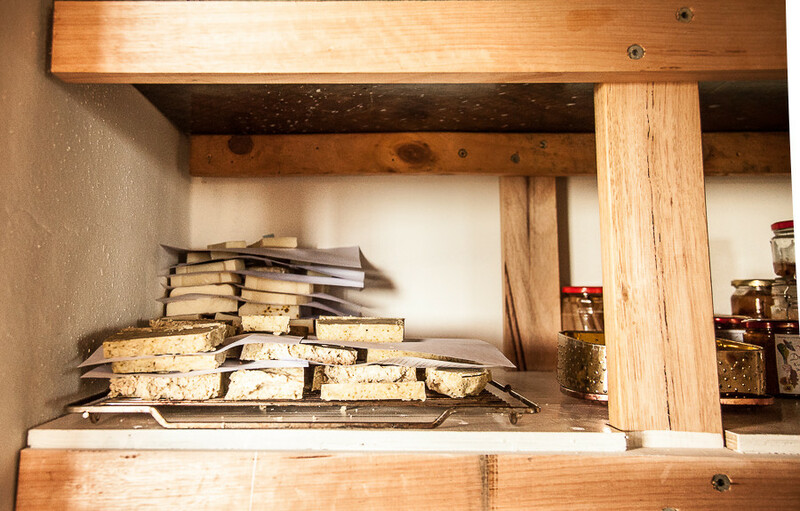 Place the dried seed on the top of the mixture once it is in the mould straight away so that it sticks to the surface. 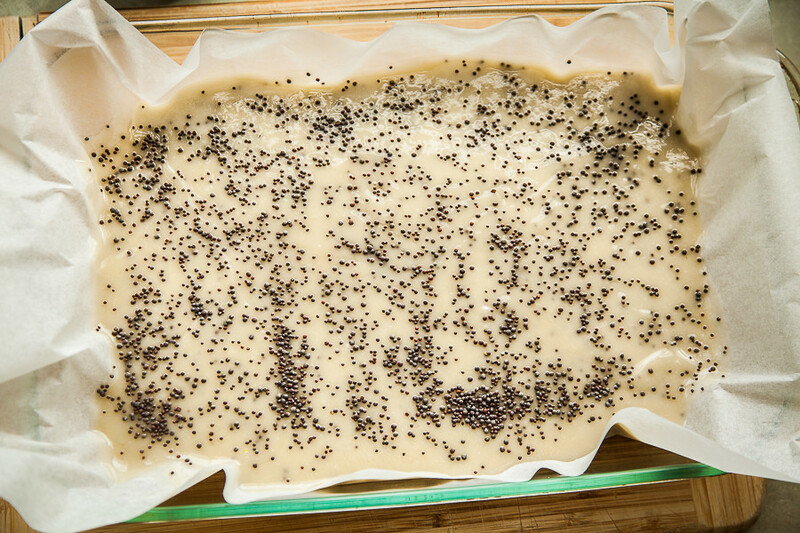 Plain soap, fennel seed soap, mustard seed soap. Leave to further cure in a dark dry place. Place paper between layers to stop the soap bars from sticking together. At the end of my soap making I started drying herbs from the garden so that I had more dried herbs to choose from for my next batch. 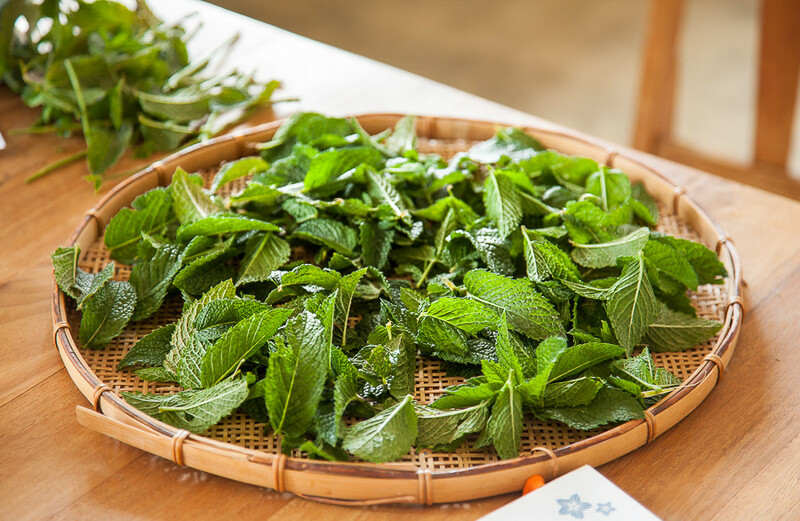 Chocolate mint drying.